1. Cut onions and chow chow finely. 2. 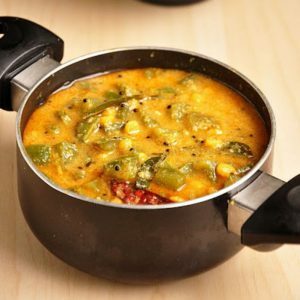 Heat a tsp of oil and fry dhania, jeera and red chillies. 3. Grind it along with coconut and roasted gram. 5. Fry onions until brown. 6. Add the vegetables, ground masala, tamarind extract and salt with enough water. 7. Keep in pressure cooker and cook till the vegetable becomes soft. Feel free to comment or share your thoughts on this Chow Chow Subji Recipe from Awesome Cuisine.